Some basic introductions to the Urban Reformation and related history include Steven Ozment, The Reformation in the Cities (1975) and The Age of Reform (1981); Gerald Strauss, Luther’s House of Learning (1978); Peter Blickle, Hans-Christoph Rublack, and Winfried Schulze, Religion, Politics, and Social Protest (1984); Lyndal Roper, Holy Household (1990); Walter Klaassen, Living at the End of the Ages (1992); Carter Lindberg, The European Reformations (1998); Thomas Brady, Communities, Politics, and Reformation in Early Modern Europe (1998); George Hunston Williams, The Radical Reformation, 3rd ed. (2000); and Peter Blickle, Communal Reformation (1992) and From the Communal Reformation to the Revolution of the Common Man (1997). 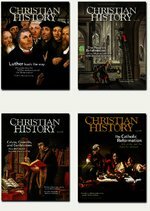 Order Christian History #118: The People’s Reformation in print. 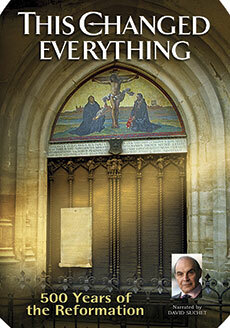 More recent works include Wayne te Brake, Shaping History (1998); Bruce Gordon, The Swiss Reformation (2002); Scott Hendrix, Recultivating the Vineyard (2004); Amy Nelson Burnett, Teaching the Reformation: Ministers and Their Message in Basel (2006); Susan Karant-Nunn, The Reformation of Ritual (2007) and The Reformation of Feeling (2010); Christopher Close, The Negotiated Reformation (2009); and Marjorie Plummer, From Priest’s Whore to Pastor’s Wife (2012). The Peasants’ War comes to the fore in Peter Blickle, The Revolution of 1525 (1984) and Tom Scott, The German Peasants’ War (1994), and iconoclasm is covered in Carlos Eire, War Against the Idols (1984), and Lee Palmer Wandel, Voracious Idols and Violent Hands (1999). The printing press is discussed in James Moran, Printing Presses (1975); Elizabeth Eisenstein, The Printing Press as an Agent of Change (1980) and The Printing Revolution in Early Modern Europe (2005); Axel Erdmann, My Gracious Silence (1999); and Lucien Febvre and Henri-Jean Martin, The Coming of the Book (2010). The Anabaptist story is told in Walter Klaassen, Anabaptism (1973); Eberhard Arnold, The Early Anabaptists (1984); William Estep, The Anabaptist Story (1995); John Oyer, They Harry the Good People Out of the Land (2000) and Mirror of the Martyrs (2000); James Stayer, Anabaptists and the Sword (2002); and David Weaver-Zercher, Martyrs Mirror: A Social History (2016). The English Reformation features in A.G.Dickens, The English Reformation (1991); J. J. Scarisbrick, The Reformation and the English People (1991); Diarmaid MacCulloch, Thomas Cranmer (1998); Eamon Duffy, The Voices of Morebath (2003) and The Stripping of the Altars (2005); and James Simpson, Burning to Read (2010). • And, discussing many of the reformers above, David Steinmetz, Reformers in the Wings (2001). 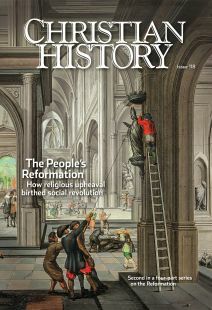 Videos about the stories in this issue include God’s Outlaw: The Story of William Tyndale; The Radicals; Reformation Overview; and Zwingli and Calvin. There are also Torchlighters episodes on Tyndale and Luther and the new original documentary This Changed Everything: 500 Years of the Reformation. 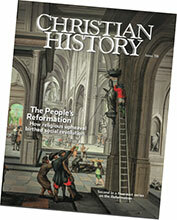 You can read writings of many of this issue’s featured people at the Christian Classics Ethereal Library. Good pointers to other primary and secondary resources can be found at the Modern History Sourcebook at Fordham University in the sections called “Early Modern World” and “Reformation Europe.” Despite its title the Post-Reformation Digital Library has many Reformation-era texts available. You can also browse Foxe’s Book of Martyrs.